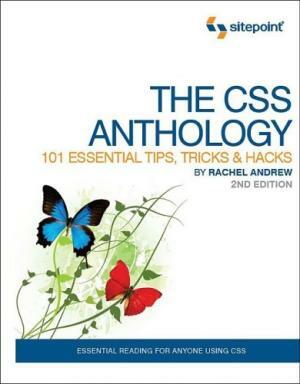 Recently I bought a copy of The CSS3 Anthology by Rachel Andrew - as well as the physical copy I got a digital download of the book. I have enjoyed reading it and figured I would post up a quick review in case you were thinking of purchasing a copy and wanted to read some opinions on it. This is my first book review since school from what I can remember, so please post any criticism as this is something I would like to get better at. I have spent many years working with CSS and have been bitten before with buying books that are either too basic or give wrong information - and I don’t mean wrong as in out of date, I mean wrong as in the samples were never best practice and shouldn’t be followed. Long story short, I wasn’t really in the market for a new CSS book. I was listening to the Sitepoint podcast and the interviewee for that episode was Rachel Andrew, I was already aware of Rachel’s excellent work and when I heard she was pulling together a combination of best practice I immediately thought “sold”. Unlike many books in the market that try and teach you CSS, this book is more aimed at showing you the current thinking behind the solutions to the more common CSS problems - this is perfect for someone like me who can write CSS but has maybe spent too long writing it his way - once you know how to solve the problem of sub-menu navigation using CSS you don’t tend to re-evaluate it too often! The book hasn’t been out long, and I know from reviewing music that you need to give whatever you are reviewing a couple of chances, letting your thoughts sink in for a couple of days and then revisiting the work to see if you still feel the same. I think this is the reason I haven’t reviewed books before - I don’t feel that one first pass is enough to be able to properly judge a book and I rarely have the time to read the same book again within a short time period. The book only actually arrived on my desk a couple of days ago, but thanks to the fact I could immediately access a digital copy of the book I was able to read through it at my leisure from the moment I paid for it. This meant that when the book did arrive I was able to give it one more read, compare notes and get writing! I really like how quick a read this book is. Rachel doesn’t labour on any particular point, she explains the rationale behind her choices and moves on and the examples are complete without becoming clunky. I like how all the major bases are covered - I had tried to think of things that maybe should have been in there, but in my opinion the issues covered are relevant to the vast majority of front end developers. I enjoyed how image rich the book was - a lot of CSS books do a before and after shot, the CSS3 Anthology does during shots as well, which is useful when you are trying to dissect the CSS being used in a solution. I appreciated how the sections had relevant pop-outs - for example when talking about text-decoration Rachel explains that adding underlines to things that are not links is bad practice, this wasn’t exactly a revelation but snippets like this are useful to read. Honestly - very little. The pictures being in grey-scale were kind of annoying when the CSS was dealing with colour, but you could always make out what was being referenced. I feel bad for only putting one negative thing (and it isn’t really that negative) so my second not-really-negative point is I don’t understand why the butterfly kite used on the front cover is relevant to CSS - the tagline of the book is “Take your sites to new heights” so maybe that is why - I would have preferred height to be a play on words with the height attribute! Oh, actually I do have a genuine gripe - some of the sections felt in places like adverts for Sitepoint, I know it is released by Sitepoint and I know that for a lot of things Sitepoint does have nice canonical answers to things, but at times it felt a little too much. As I am sure you picked up from reading what I disliked about the book, there wasn’t really anything - I enjoyed it and I think so long as you have a basic to good understanding of CSS you will too.